Proof Brewing Company is about to move into a new facility that will triple the size of its current Railroad Square location and will, through a restaurant called Proper, make food a part of its customers’ experience. The company plans a Feb. 1-3 “soft” opening of its new 34,000-square-foot location at the old Coca-Cola Bottling Company building on South Monroe Street, near Cascades Park and the Capitol. 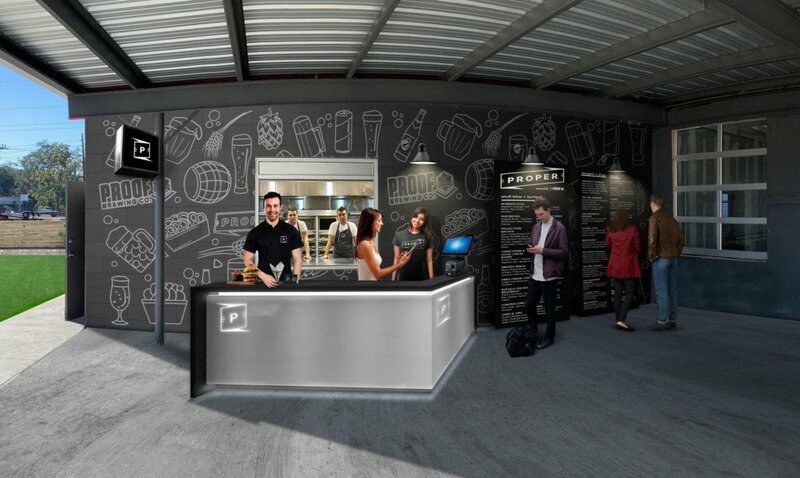 The facility will include a beer garden — or outdoor drinking area — that doubles its current capacity, plus 3,500 square feet of tasting-room space. Proof plans an official grand opening Feb. 8. Proper, the restaurant, will feature burgers, sandwiches and small plates, plus suggested beer pairings, and will include a kids menu and vegetarian options, the company said. The restaurant, a standalone fixture inside the facility, is the inspiration of Brad Buckenheimer, owner of Canopy Road Café, and Viet Vu, owner of Izzy Pub and Sushi, the company said. “It’s a concept you’re starting to see” in the industry, Burroughs said. The new brewing area measures 21,000 square feet of space compared with 7,500 square feet at Railroad Square, Burroughs said. The facility also includes event space and a covered patio area, plus space for a laboratory and quality-control area. The company plans quarterly releases of new beers and a launch in cans this spring of its Proof Lager and La La Land IPA, Burroughs said.